One of the key realisations that many people will face during their working lives is that nothing is permanent. It’s highly likely that either yourself or someone close to you will face redundancy in the future. This is due to the changing nature of work and the workforce where companies can change direction and realise they don’t need a particular role, or in fact an entire department. It also doesn’t matter whether you are in a large or small organisation, or in fact a government employee. Redundancy can come as an unanticipated shock, an expected process or a welcome change depending on many factors both personally and professionally. 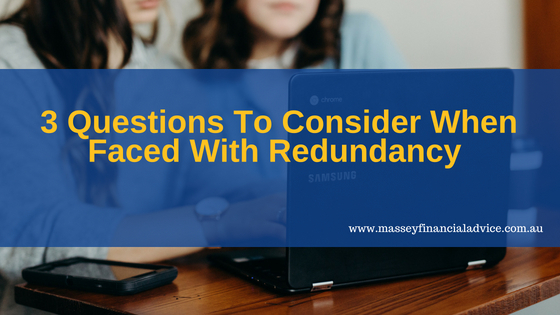 If you are faced with redundancy there are a number of questions you should ask yourself to ensure you are prepared financially for what comes next. Question 1 – How Close Are You To Retirement? An important factor to consider is how close you are to retirement. For tax purposes, a non-genuine redundancy can occur for several reasons, but one could include being dismissed on or after reaching normal retirement age. The tax rules differ for non-genuine redundancy – which might significantly change your “in hand” end payment. 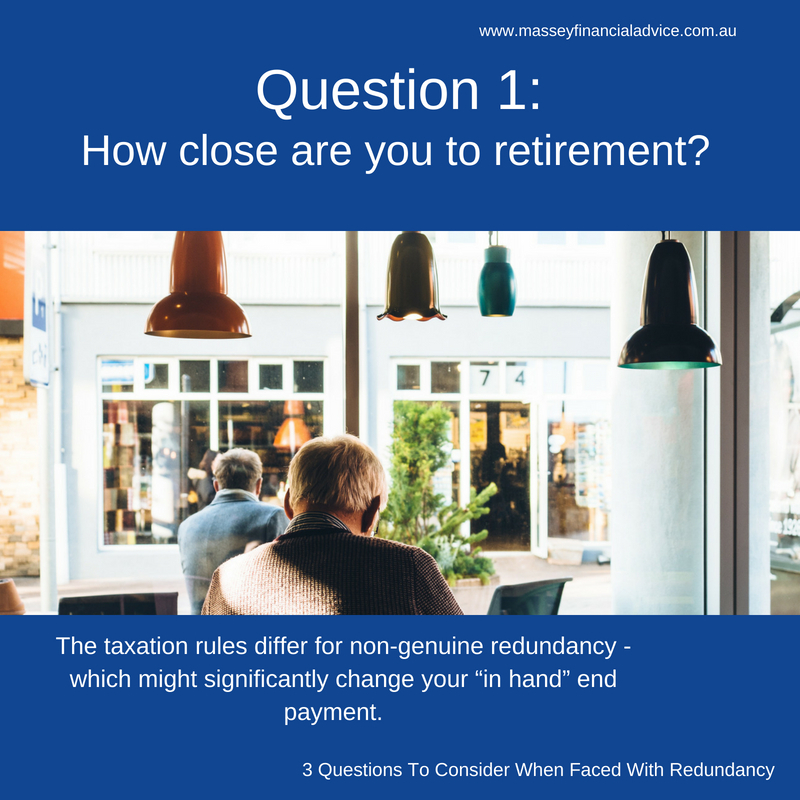 Consider the taxation implications of your redundancy if you are close to retirement age. For a genuine redundancy there are special tax rules on the various elements that make up your payment. Question 2 – What Are Your Immediate Needs? If you aren’t close to retirement age, it’s likely that you’ll have many non-negotiable commitments. If you don’t have a concrete budget already – you need to create one quickly. Have a clear picture on how long your payout will last, what plans you can put in place while job searching, and how to minimise your non-necessary spend. This will reduce stress and allow you to focus on landing that next great role. Try to make the money last so you can choose the right role, rather than accept the first offer. 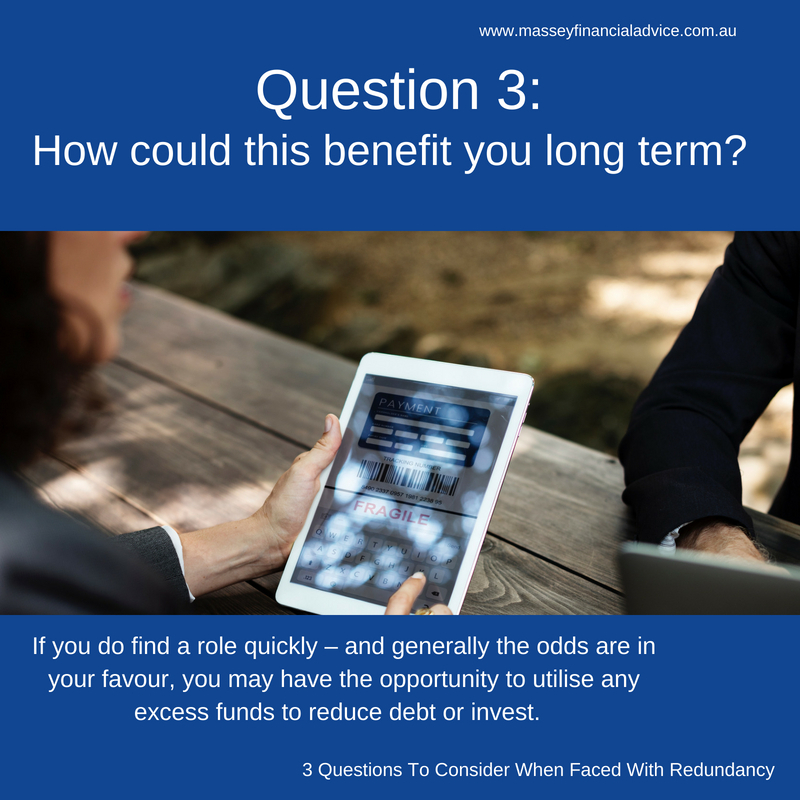 Question 3 – How Could This Benefit You Longer Term? If you do find a role quickly, you may have the opportunity to utilise any excess funds to reduce debt or invest, setting you on a new and prosperous path for the future. Seek.com.au found that “60% of Australians made redundant found another job within two months”. 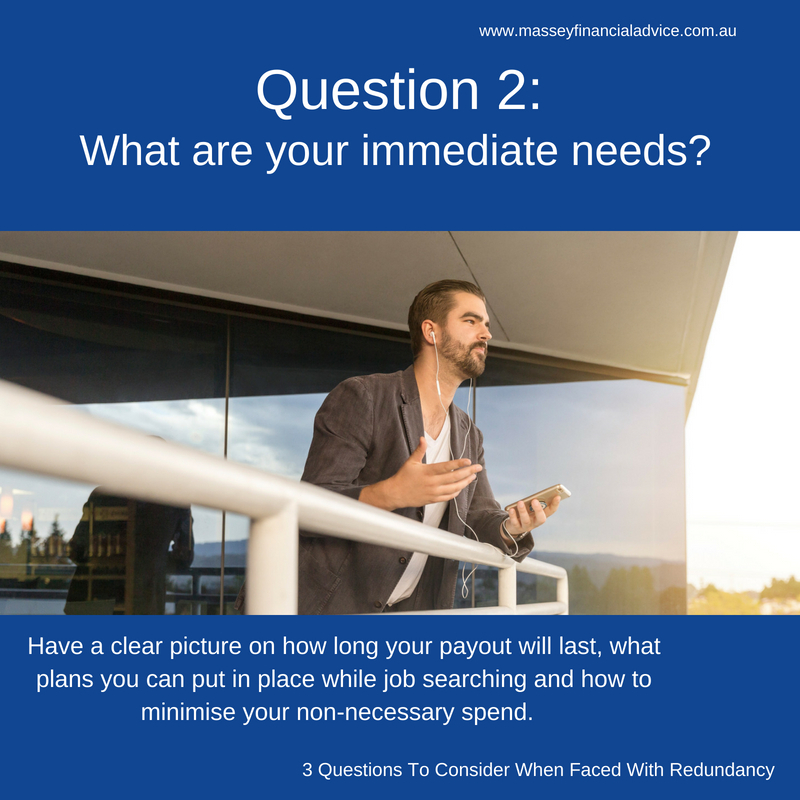 Source It is best not to squander your redundancy payment as the money may come in handy if finding your next role takes a little longer, or you need to retrain. Some people utilise redundancy as a time to start a new business, venture into consulting or reduce work hours to gain a more balanced lifestyle. Sometimes, organisations offer voluntary redundancies to employees who elect to move on from employment. If you are thinking about accepting a voluntary redundancy, it’s important to balance your current financial obligations and lifestyle with the redundancy package on offer. It’s also important to assess how long it might take you to secure another role, at the same level of renumeration and benefits – in your industry. If you use redundancy as an opportunity to change career, you need to be realistic about the cost and time required to start earning the same as you did previously. Remember, redundancy can come as a shock, but look at it as a new beginning. It provides the opportunity for a fresh start. From my experience, take a short time to experience the various emotions, especially if it is unexpected, then regroup and work towards your ideal position. With a little planning and a forward looking focus, you will likely end up in a much better position. I am a Brisbane based financial adviser with clients in Ashgrove, The Gap, Kenmore and Chapel Hill. I help professionals make informed decisions and take back financial control.